This image shows a relatively dark lava flow on the Tharsis volcanic plains, east of Arsia Mons. The entire region is composed of a thick stack of volcanic flows. The lava flow in the northern part of the image is distinctly darker than its surroundings, which are buried under a layer of dust. Most of the image has a fluffy, blurry texture. This is the mantle of dust or volcanic ash that commonly coats volcanic regions on Mars. 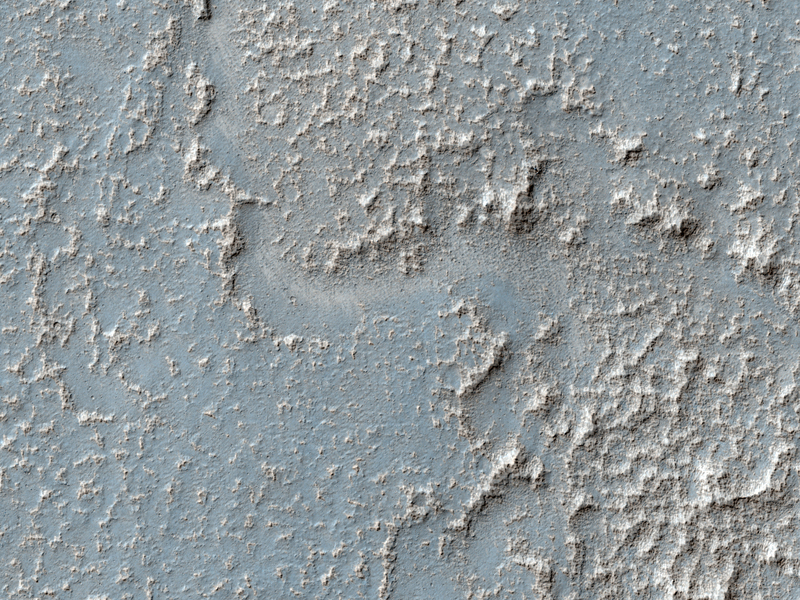 The dark flow is buried by this material along its southeastern boundary; it appears that the mantle is being stripped off of the flow surface. Perhaps this flow is somewhat smooth at a fine scale and traps relatively little dust. This flow is probably young. The Western edge of the dark region does appear to be the edge of the lava flow, indicating that this flow is relatively high-standing. This could make it more exposed to the wind and allow the mantle to be stripped.